This handy device is the easiest-to-use tip calculator we’ve found. 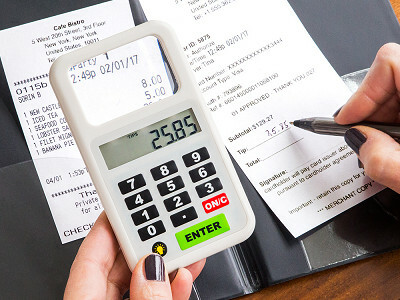 Tuck it in your pocket or purse and there’s no need to consult a smartphone (or try to do mental math) to figure out tips and split restaurant checks. Tip 'n Split looks like a typical calculator, but it’s streamlined to determine the tip then the amount each diner owes—and that’s it. Connie Inukai created it for retirees like herself. She and her friends would have difficulty reading menus and the bill while dining out, and many didn’t own a smartphone. So Connie’s device does the dining out math, and it has a built-in magnifier and LED light, too, to help see things in dim lighting. Using Tip 'n Split is intuitive. On-screen prompts help you divvy up that check with a few taps. Hello Grommet fans! I’m Connie Inukai, Founder of Tip 'n Split. I am excited and honored to have my invention featured as today’s Grommet. 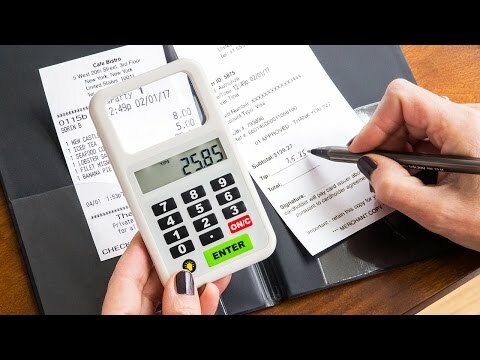 I created Tip 'n Split to help diners read small print on the menu or bill in dimly lit restaurants and also to help figure out a tip and split the bill, all in one device. Are batteries included ? Also, what kind of battery works with the device? How bright is the light? I think this is a great gift idea. @Arnold Thank you for the question, Arnold! Batteries are included. To replace them, you can buy 3 LR44 button-type batteries that will last approximately about one year, depending on usage. It's an LED light and bright enough to see the menu and bill clearly, not not so distracting as the light on an iPhone. Thanks for the question, and I'm sure you'll love it. The person or people who you give it to will thank you for it! How is this different from an Android or I Phone? @Jacqueline Thanks for this question. I get asked that a lot. The Tip ‘n Split is a handheld device. It has a magnifier, light, and calculating device all in one. Unlike a smartphone, no wifi is necessary. And, believe it or not, some people do not have smartphones—or do not want to use them at the dinner table because they are distracting. Also, Tip ‘n Split is a great gift at an affordable price for a loved one, unlike a smartphone. So...when you forgot your reading glasses and need extra light, Tip 'n Split is right there. It also makes figuring out a tip and splitting a bill simple! Tip ‘n Split is so handy and attracts a lot of attention. Everyone at the dinner table will be amazed at how simple it is to use. Thanks for your question, and let us know what you think! This is a great idea. We have a group of women that go out together and we always have this issue. Do you key in the percentage of tip you want to leave or how do you change what is already in the calculator. Also, what are the dimensions of it. Thanks for putting on your thinking cap and invented this ingenious little gadget. @Nikki Good morning, Nikki. After you enter the amount of the bill, the display will prompt you to enter a tip percentage. You can enter 15, 18, 20, 22--or any percentage you desire you choose. Then press enter. The amount of the tip will appear. You can press Enter, and the total (bill plus tip) will appear. Another option is to enter the tip percentage, and when the tip amount appears, you can round it off to a dollar amount.For example, if the tip amount is $14.56, you can push Enter, and type in $15.00. This is easy once you have the device in hand. The device is 2.6W x 4.57H x 0.37D. It fits easily in pocket or small purse. I thank you for your comment, Nikki! @Connie Nikki, the calculating device has other capabilities. Once you enter your desired tip, you can always change it by pressing Enter and changing the percentage. This might be the case if the server was exceptional and you want to reward him/her more than you had originally planned. You can change other entries as well. For instance, if when prompted to "split" the bill and there are 5 people, you can change that number to 4--if perhaps one of your friends is having a birthday and you want to treat her. I think your friends will love playing with this so when the bill comes, everyone will want to try it. I do not mean any offense, but how difficult is it to add the tip, round up to the nearest dollar and divide by the number of people? Also, if someone is that "thrifty" to need tabs split to the penny, are they going to spend $20.00 for this device. Once again, I do not mean any offense. These are questions I would have if I were asked to sell it. @Steve The main features of the device are its magnifier and light. An unfortunate problem of aging is that our vision gets poorer. While many people do not have the problem of reading small print, people who have this problem appreciate this handy device. I added the tip and split features because I noticed that often when the bill comes, the mood changes, and diners go from "fun" mode to "math" mode. In a group, one person is usually delegated to do the calculations. I'm sure that most people can do those calculations in their head, but these are just fun features I added. A person does not have to use these calculating features. For example, my son tells me that when he goes out with his family, nobody asks to split the bill. I appreciate your feedback. @Connie I am a male math whiz who does need to see the bill before I can do my mental acrobatics with the tip and split. Looking forward to getting the product so that I can see the menu and bill. This seems like nothing more than a calculator with severely limited capability. Wouldn't it be much more practical to carry a small calculator. Then multiply the bill amount by 1.15 (for 15%) or 1.18 (for 18% tip) to get the total bill....then divide by the number of people? Yeesh! Also, who in the world splits bills anymore? Most people these days only want to pay for what they actually ate. Not somebody else's "surf and turf!" What a sad world we live in that people can't do simple math in their heads! @David See my response to Steve above. I know this device is not for everybody. Many women go out in groups and do split the bill. I was formerly a college teacher, and my students told me that they liked it and would use it, especially when they were out drinking with friends and had too much to drink and didn't want to bother with the calculations. I agree with your comment that people can't do simple math in their heads. Just look at the grocery store. If you pay cash and give a nickel to make an even return, the clerk doesn't know what to do.I don't think you will be buying one, but ask your mom. She'd probably love it for Mother's Day. @Sandra Thanks, Sandra. I appreciate your support!! This handy device is the easiest-to-use tip calculator we’ve found. 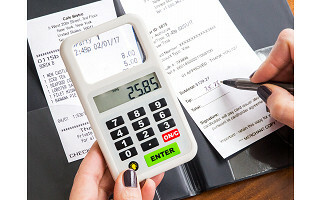 Tuck it in your pocket or purse and there’s no need to consult a smartphone (or try to do mental math) to figure out tips and split restaurant checks. Tip 'n Split looks like a typical calculator, but it’s streamlined to determine the tip then the amount each diner owes—and that’s it. Connie Inukai created it for retirees like herself. She and her friends would have difficulty reading menus and the bill while dining out, and many didn’t own a smartphone. So Connie’s device does the dining out math, and it has a built-in magnifier and LED light, too, to help see things in dim lighting.